Hiking trails offer an overview of the Blue Ridge Mountains. Golfing is one of Asheville's star attractions. Boating on the lake outside the Biltmore Estate. 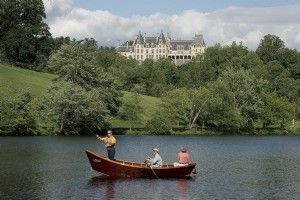 The Biltmore Estate does lots of family programming for weekend visitors. With great leaf-peeking, historic mansion tours and free music festivals, western North Carolina’s favorite city is always fun for a cultural family vacation. For such a quaint town in such a quiet region, Asheville, North Carolina has surprisingly much to offer in the way of small-city ambiance and cultural entertainment. 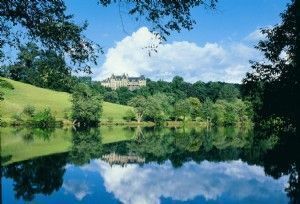 America’s largest private mansion, Biltmore, may be Asheville’s best-known attraction. But the real draw for families visiting this area lies just a bit outside of town, where visitors discover hiking in the beautiful Blue Ridge Mountains. The Blue Ridge Parkway, one of America’s most scenic byways, celebrated its 75th anniversary in 2009. In addition to hiking trails, picnic spots and scenic overlooks, this drive allows families to explore small towns with vestiges of Appalachian culture and get a real feel for this corner of North Carolina. First though, visitors will want a glimpse of the alternative lifestyle lived by America’s rich and famous and, any as family with tweens or teens will know from the popular “Gossip Girl” book series and TV show, the life of Nate Archibald (a Vanderbilt heir) is pretty cool! Once the home of George Vanderbilt, historic Biltmore (800/411-3812, 1 Approach Road, Asheville, NC 28803) is truly a magnificent estate. This huge and somewhat eccentric property features the 250-room French Renaissance chateau itself, a winery, and beautiful gardens designed by the noted Frederick Law Olmsted. Families benefit from several seasonal promotions (such as free admission for kids under 16 in summer); Older kids and grandparents will enjoy touring the estate’s educational exhibits of well-preserved historical artifacts and kids will delight at a maze made of over 500 trees. All ages will enjoy ogling the acres of gilt and marble. At River Bend Barn, the property’s interpretive center, families can learn about the estate’s working life during the 1890’s and see costumed blacksmiths, woodworkers and other tradespeople, or tour an old-fashioned Mercantile shop and Creamery. It’s well done and entertaining, too. There are weekend events and music performances throughout the year, but each April and May is the annual Festival of Flowers, a time when more than 90,000 tulips burst into bloom in the Walled Garden with the Biltmore’s 8,000-acre backyard. Kids will love running around here. Within the picturesque town of Asheville, catch sights such as The Thomas Wolfe Home (828/253-8304, 52 North Market Street Asheville, NC 28801) and the historic Smith-McDowell House Museum (828/253-9231, 283 Victoria Road Asheville, NC 28801), built by a wealthy citizen 20 years before the “War of Northern Aggression” and open to the public for almost 30 years. It is one of the oldest surviving houses in Asheville. Many sites are included on the town’s self-guided Asheville Urban Trail, a 2-mile walking tour that is well signposted. Families will find more than 200 shops and boutiques in town, many tucked into renovated Victorian era homes. In nice weather, take the time to admire local street performers who entertain tourists and the young collectors who breeze in and out of the many galleries. Older kids may enjoy a stroll around the River Arts District or Biltmore village, where there are more galleries and crafts shops. In the Asheville township, be sure to begin your day at the Folk Art Center (828/298-7928) to see craft demonstrations (look for woven sweet grass baskets); the staff here will also help with general Parkway information and trip planning. Another favorite family attraction is Chimney Rock Park (800/277-9611), which features a 500 million-year-old rock nearly 120-feet tall. 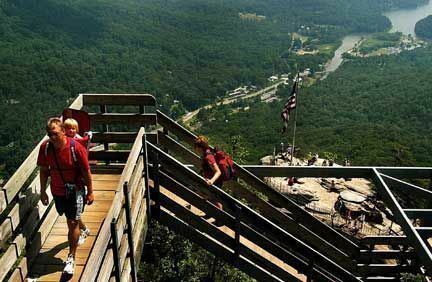 You can take a 26-story elevator to the summit, then hike the Skyline Trail to the top of Hickory Nut Falls and watch while it plunges 404 feet down, or just picnic on one of the wildflower meadows. The Nantahala Outdoor Center (888/905-7238) in nearby Bryson has great rafting facilities and whitewater daytrips. With access to six rivers, world-class instructional clinics, and a great family program, NOC boasts resources that other whitewater tour operators only dream of. During spring, families can take the challenge of rafting the recently released Class IV Cheoah River and participate in the “high water” celebrations. The Fairgrove Carriage Company provides equipment and instruction in mountain biking, hiking trails, and half-hour tours of the Biltmore Estate by carriage. Through them, you can also organize horseback riding on the estate’s 100 miles of groomed trails. Check their website for special seasonal events timed to whatever outdoors opportunities nature presents. 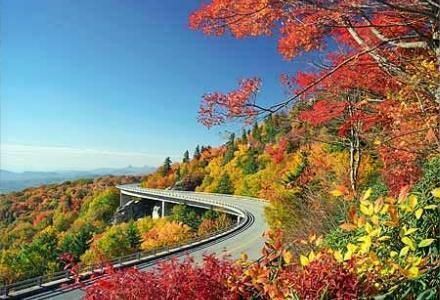 Families with more time, especially in autumn, will want to tour the scenic Appalachian foothills and the imposing Blue Ridge Mountains. The Blue Ridge Parkway offers many stops to explore the culture of the southern Appalachian Mountains. It stretches from Shenandoah National Park along the Blue Ridge of the Appalachians, then continues along the southern end of the massive Black Mountains. Many visitors don’t realize that after Vanderbilt’s death in 1914, a large part of Biltmore’s 125,000-acre estate was bought by the government to create the Pisgah National Forest, today the locale for many outdoors programs. If you don’t find a hiking trail that meets the family needs (they do have short and easy, to pretty steep and harder, trails just off the Blue Ridge Parkway), then consider exploring Pisgah or the Nantahala National Forest. Leaf peekers should listen to Dr. Neufeld from Appalachian State University, who reports on the state’s foliage: “If September has a predominance of sunny days and cool nights, there will be good fall color.” By mid-September, families can expect to see vivid red leaves on the sourwood saplings and Virginia creeper, and leaf tones ranging from yellow to gold to scarlet on the many sugar maples. Dr. Neufeld adds that the highest altitudes in the state often see peak color the first two weeks in October, with Asheville and the foothills following later in the month. Western North Carolina’s fall foliage season is prolonged by the varying elevations, microclimates, and nearly 100 species of deciduous trees in the Blue Ridge Mountains. Check the weekly foliage reports at www.fallinthemountains.com (828/258-6101) for the best color viewing spots. If it’s getting too chilly (not likely in their temperate Indian summers), book a ride on the Great Smoky Mountains Steam Train (800/872-4681, 226 Everett Street, Bryson City, NC 28713). On this year-round excursion, you can chug your way through the Tuckasegee River Valley or the Nantahala Gorge, along 53 miles of track, through two tunnels and across 25 bridges. If you’re into festivals, the Asheville region boasts several annual musical events hosted by LEAF, the Lake Eden Arts Festival (828/68-MUSIC, 377 Lake Eden Rd, Black Mountain, NC 28711). North Carolina itself is an active festival state that families can explore even further. Up north in Mount Airy (800/948-0949), the annual Mayberry Days Festival honors the birthplace of TV star Andy Griffith. The town says this is the event for “those who long for the days when life was simple and the Sheriff didn’t carry a gun;” it’s held over a long weekend in late September. Also during the early fall, over in Johnston County to the east, your more stubborn relatives will love the annual Benson Mule Days Celebration (919/894-3626). Whew! You probably didn’t realize how much there is to do in and around Asheville. Several area accommodations welcome families with autumn and other seasonal specials; summer is the true high season here. At the Biltmore Estate (828/225-1333), families will enjoy luxurious facilities at the property’s elegant inn and can visit the estate’s wine bar weekends for live jazz and blues music. The Grove Park Inn Resort & Spa (800/438-5800, 290 Macon Avenue, Asheville, NC 28804) is a popular AAA four-diamond property; it’s more expensive but new parents will especially like its fireplaces and more intimate feel. Cribs and babysitting are available on request. 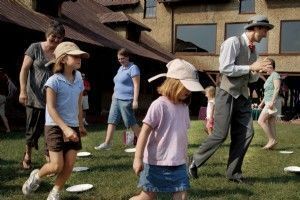 Those with older children will appreciate the historic resort’s Cub’s Adventure Camp which operates daily except Sunday in summer and Saturdays for the rest of the year; it’s for ages 3-12 and features evening activities so that adults can go out. For some wonderful B&B suggestions, visit the Asheville Chamber of Commerce website or call 828/258-6101.